Why Do I See a Different Wi-Fi Driver Version With My Intel® Wireless 7265 Family Adapters? The Intel® Wireless 7265 Family adapters have two different hardware revisions and each installs a different Wi-Fi driver version. 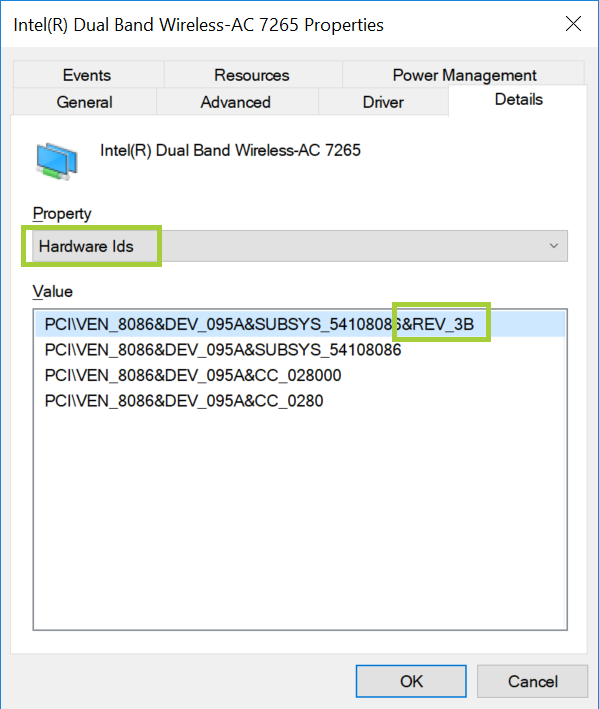 First, identify which hardware revision of the Intel® Wireless 7265 Family adapter you have using one of the following methods. 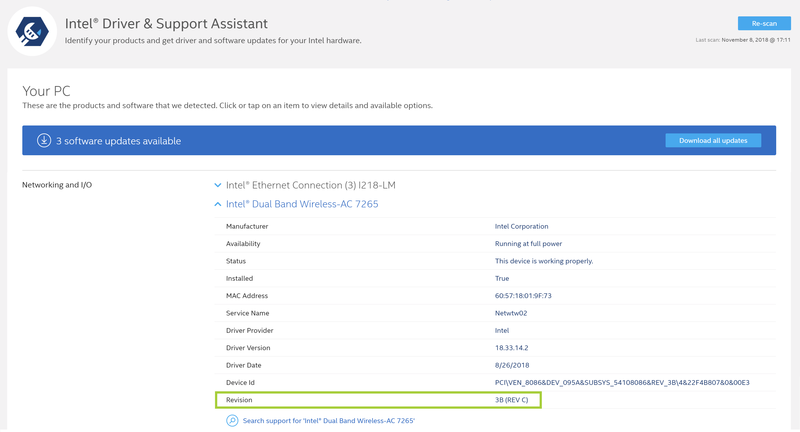 Option one: Auto-detect identification You can automatically identify the hardware revision of your Intel® Wireless 7265 Family adapter and update the drivers using the Intel® Driver & Support Assistant (Intel® DSA). This is the easiest method. You can identify the revision of the adapter by using the Details tab in Device Manager. In the Details tab, select the Hardware Ids (1) string in the Property field. The REVID parameter (2) represents the hardware revision. Any other REVIDs indicate a hardware revision D sku. Note All three drivers are included in the latest Intel® PROSet/Wireless Software 20.x. The installer will automatically install the appropriate Wi-Fi driver for your Intel Wireless 7265 Family adapter. No license (express or implied, by estoppel or otherwise) to any of Intel’s intellectual property rights is granted by this document. Intel disclaims all express and implied warranties, including without limitation, the implied warranties of merchantability, fitness for a particular purpose, and non-infringement, as well as any warranty arising from course of performance, course of dealing, or usage in trade. No computer system can be absolutely secure. Check with your system manufacturer or retailer or learn more at intel.com. All information provided here is subject to change without notice.